Oh Rita, such a tempting post, full of mystery and hints! Well, I will have you know that at home I am sometimes known as Columbo, when I solve the mysteries and uncover misdemeanours in the home, however, I don’t know you as well as my usual culprits, so it’s a harder job to read your tells! My first guess would have been an exciting new book (North and South / P&P crossover?! ), but you’ve ruled that one out. I know that Joana sometimes dresses up in regency garb, so something connected with that, maybe a talk etc, but I think I will plump for one of Joana’s books being converted to audio, which would be very exciting news. Whatever it is, I wish Joana the best with it, and I’ll be interested to find out what it is. As for the prize, since I have all of Joana’s books in ebook, and all bar one in paperback (I’ll get it at some point, to complete my Joana Starnes set! ), I would love to go for the mystery prize, whatever it is. Oh, my poker face is rubbish, Ceri, in real-life conversations and online too 😀 So how am I to say anything without giving the game away? Keeping schtum, that’s how, but I can’t, because I want to say how much I loved your comment!!! Columbo? Mmmmm, interesting! And terrifying 😉 Oh, I’d love a North & South / P&P crossover, that must be delicious!! I heard that someone’s doing that or thinking of that and I’d love to read it. Hope it’s not just wishful thinking! Thanks ever so much for all your support over the years and the vote of confidence, you’re awesome!! She’s pregnant? Wow! Congratulations. By chance are we giving birth to a new audiobook? I can only hope. If so, I certainly hope it doesn’t take 9 months to be on the market as I WANT IT NOW!!! Maybe you are giving away the chance for a character in your next book to be named for us. In that case, I want to be the Dowager Countess aunt of Lady Catherine de Bourgh who intimidates the daylights out of that woman as well as her two great-nephews, Darcy and Fitzwilliam. They would tease about “Joy” being an oxymoron with her personality. Doesn’t the Dowager Countess Joy Dawn King have a nice ring to it? Or, you could use my maiden name “Malone” and I could have a bit of the Irish thrown in. Dare you!!! I KNOW!! I KNOW!!! You are asking us to choose the first name of Colonel Fitzwilliam for your next book so he isn’t Richard. I vote for Fritz Frederick Ferdinand Fitzwilliam. Yep, that would get my vote. It’s a deal, your ladyship 😀 Lady Joy Malone it is. And poor Fritz Frederick Ferdinand Fitzwilliam!!! Or rather his poor nanny who had to call him in for tea! Oh dear. Well I would have said a new book but I know that’s not it. I would love it to be a copy of her Darcy Monologues story. I don’t use KU as I prefer to trad any books I like over and over again so I buy them. I usually buy books recommended on blogs like yours Rita. When I first started reading JAFF I didn’t have a kindle so bought paperbacks based on descriptions and I have only had half a dozen that I didn’t trally enjoy so I gave them to a charity shop. I also started with paperbacks, but now I inky buy them when I can not resist the cover or when I really love the cover! Good choice with the surprise gift! So happy you’re impatient for The Darcy Monologues, Glynis!!! It’ll be worth the wait, the stories are exquisite. Still trying to pick a favourite and can’t narrow them down. Delicious treats, each and every one, you’ll love them! That’s how I started with JAFF too, buying them in paperback, but thank goodness for Kindle, the house would’ve collapsed 😀 Thanks for stopping by to leave this lovely comment and all the best! I am impatient Joana but it is only 24 days now! From reading other comments I see the surprise gift MAY be an audio book in which case I will put my name in the hat for the goodie bag as I don’t have audio books. I prefer to read at my own pace and often flip back to ‘re read sections. Whatever it is, good luck with it. And yes Rita I have found some wonderful books through yours and others blog sites and never had a bad one 😁 so thank you to all of you. ❤ Thanks so much, Ceri!! ❤ So happy to hear that!!!! I hope you’ll like it too, Glynis, and the whole delicious package that TDM is 🙂 Oh yes, I so get the need to flip back! It was great to learn how to bookmark favourite passages in Kindle, to be able to ‘flip back’ e-books too. Congratulations Joana on joining KU. I own all of Joana’s books, so don’t count me in for them, please. Thanks ever so much for that, though, I’d better get cracking!!! If it’s not a new book, then surely it must be to do with The Darcy Monologues as she’s one of the contibuting authors. I don’t have Kindle Unlimited as I don,t have the spare time to make the most of it but I can certainly recommend Joana’s books to all of my JAFF friends. As I have all of her published works so far, as ebooks or paperbacks or both, I’m going to take the plunge and go for the surpise prize! Thanks so much for the wonderful words, Anji!! I’m over the moon that you liked my books, and thanks for the awesome recommendation! We still have to get together, fingers crossed someday soon!! Hugs and hope you’re keeping well. I am just like you Anji. I used to have KU, but I couldn’t read everything I downloaded, so I eventually canceled the subscription. But it is such a good option for people reading more than 2 books a month isn’t it? What a fun post. O have read each of the books and each time I think the one is the best the next oven is even better. What a generous give away. I always think that as well Deborahanne, but she always surprises me too by going the extra mile! Thanks, Debbie, for the wonderful words about my books!! So glad you liked the post. I hope you win something nice and that you’ll like that too! I have enjoyed all of ms Starnes books and news of a new something in the works is exciting! I would like to. I entered to win mr bennets dutiful daughter as that is the only one I haven’t read. The other prizes are intriguing too! Thank *you* for stopping by to leave this lovely comment, Theresa! I’m so happy you enjoyed my books and I hope you’ll like Mr B’s Dutiful Daughter too if you win it. Best of luck and fingers crossed! Rita,what a mysterious and intriguing post!!! Am delighted that three of Joana’s books are now available on KU. I’ve treated myself to all of her books,and yes,angst filled they certain are! The reader certainly suffers along with our beloved characters before the hard earned HEA is delightfully and gratefully delivered into their hands! Needless to say,Joana is a wonderful storyteller and all of her books are highly recommended!! Would love to win the goody bag,but honestly,I really cannot think what the surprise can be!! I guess I’ll just have to wait and see!!! Sincere thanks to everyone concerned for such a fantastic giveaway! Rita, thanks so much! For this amazing post at such incredibly short notice and for such glowing praise too, you’re ever so kind!! Great to hear you liked the bookmark too, we’ve got to go shopping in Chawton again – soon! Thanks for stopping by, cvtperez! KU is so good like that, helping you discover new books you might like. I hope you’ll like mine when you’ll read them. Best of luck in the giveaway! Thanks for sharing, I have a few of these books on my to be read list on goodreads (I don’t own any) but I had not heard of The Unthinkable Triangle before and it sounds really good. I do not read ebooks (just print) so you do not need to enter me for any ebook prizes but I thought I would enter for the non ebook prize and thank you for sharing. I had actually added Mr Bennet’s Dutiful Daughter to my austenesque to be read shelf on goodreads earlier today. Good luck to everyone in the giveaway! So happy you liked The Unthinkable Triangle so much, Rita! I hope you’ll like it too, Chelsea, and Mr B’s Dutiful Daughter. So glad this one already was on your TBR list at Goodreads! Best of luck in the giveaway and thanks for stopping by! I so wish it was a new book, Jen! But I’d better not rush it, and it’s new trails for me, tongue-in-cheek rather than angst. There’s angst too, it’s got to be, but I’m having a lot of fun with the light side, and I hope you’ll like it too. Thanks for stopping by to leave this lovely comment, and for your wonderful support! Rita… Wow! I tried to read through the comments thus far to see what people were thinking. Man, this is a creative group… I am impressed. Don’t include me for the books as I already have all of Joan’s books… hello Joan [waving across the pond]. I will give a guess on something to do with travel. Perhaps our dear Joan will contribute in a collection that deals with Austen places of interest??? We’ve seen some of your fabulous photos of your travels and you look so nice in your Regency dress. 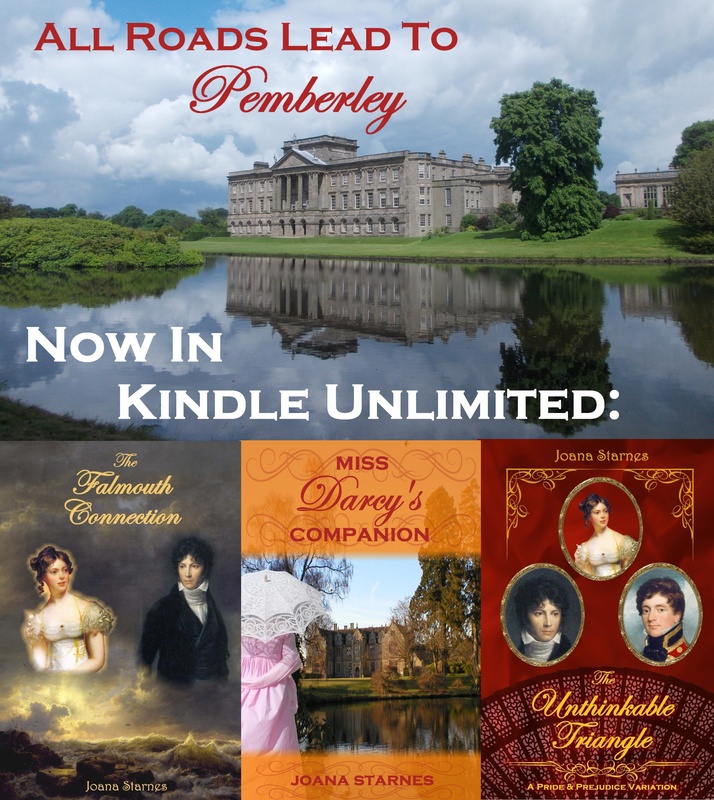 Yep… travel and Austen places of interest. Whatever it is… I am sure it will be smashing. Blessings on whatever you put your hand to my friend. We are all very excited for you. Oooh I’d love that!! I think I might rope a few ladies into doing a Regency tour – in costume! Rita, are you in? 😉 All we need is a minibus full of dresses & hat-boxes, lots of cameras (and phones that work!!) and we’re away – how fun would that be? Thanks ever so much for your wonderful support, Jeanne, and this dreamy comment! Lots of hugs and have a gorgeous day! So happy you are on KU! If the surprise is not a book I’m hoping it is a nice warm Pemberly blanket. I could curl up with it while I read more books! I sure would like the surprise! Hope you’ll like my KU books, Sally! All the best and thanks for stopping by! So happy to hear that, Nicole!! I hope you’ll like it. Pls download Falmouth too, it’d be great to know you have the revised copy! I fiddled with the previous version a little (did I mention by any chance that Fiddler is my middle name? 😀 ). As for my news, would I give the game away if I say it’s all thanks to 3 fabulous people: Rita, you & someone else? I know who the other someone is! My lips are sealed, but y’all are in for a treat 🙂 I will definitely be downloading the revised version of Falmouth! It’s true, Rita, you *know* that otherwise I’d be still ummm-ing and errr-ing 🙂 . You gave me nudges & pointers and the best pointer was towards Nicole who was amazing!!! Thanks ever so much, lovely ladies ❤ , I’m so lucky to call you my friends!! Wow, Joana, this is a great way to celebrate your books! I love your stories. Best of luck with your new announcement! Thanks, Rita! Thanks ever so much, Suzan! As I love yours! Hope you have many more for us. Best wishes and good luck! I know, she’s going to announce that she’s a long lost relative of Jane Austen (or of Colin Firth, take your pick)! I don’t have KU either, I just buy them when I can. Thanks for this fun post and giveaway. I would love to win an ebook. Oh I wish, Kim – either of those 2 wonderful ideas!!! Dreaming about them is as good as it gets, and it’s such fun! Best wishes in the giveaway and many thanks for taking part. I do not have KU, because I keep the books to reread many of the well written Elizabeth and Darcy novels, and Joana Starnes is definitely one of the best Pride and Prejudice Variation storytellers there is out there. This post makes me want to reread the three books mentioned so I think I’ll take a break from the many JAFF sites and read these books again. I must go back a read my review for “The Unthinkable Triangle” – I think this story made me think about buying stock in Kimberley-Clark! Thanks so much for the kind words, Carol, much, much appreciated!! And loved the ‘buying stock in Kimberley-Clark’. And Cadbury’s too, I hear it helps 🙂 Thanks again and all the best! Miss Darcy’s Companion is on my to-read list! I must check this out. So glad, Terry! I hope you’ll like it. Best wishes and good luck in the giveaway! So mysterious. Eagerly waiting the surprise news. Thanks and I hope you’ll like it. This is so wonderful and I’m especially intrigued by the mystery. I’m guessing an audio book narrated by Richard Armitage or Adrian Lukis! 😊 I would be thrilled with an Sufi book period. Maybe Sophie Andrews would narrate with one of the guys! Wouldn’t that be fun! Whatever the mystery surprise us, I’m sure it will be great if it’s from Joana. I’ll have to go with the surprise gift. I have all her books in eBook format and all but one paperback. Can you tell I like her writing! Fabulous doesn’t even describe it adequately. Thanks for another great post, Rita. Now we need to work on thes N&S variations. Are you game Joana? Sufi??? Should never do these comments on my phone. That should have been audio. What a great mystery. I am never very good at solving mysteries but my guess is that one of her titles will be released in audible. If I were to win, I would love to receive an ebook. Thanks for the giveaway and I look forward to finding out what the big news is! Thank *you* for stopping by, much appreciated! Best wishes and the very best of luck! Joana, I love your books! My guess for the surprise news would be an audiobook! If I win a prize, I would like an Ebook version of either From This Day Forward or The Second Chance. So happy you love my books, Jeannine, it’s so wonderful to hear that. Thanks for taking part in the giveaway and fingers crossed 🙂 If you win one of those books I hope you’ll like it. I always say Joanna Starnes has a special place in my JAFF story – The Unthinkable Triangle was the first ever P&P variation I read, after being the lucky winner of the launch giveaway here at FPTM! Also, this was what brought Rita and I back into contact years after college! I am always up for more books, indeed! Similarly to many here, I rather keep them to reread as I please, so KU is not so enticing, but I can see the appeal. For the giveaway, apart from TUT, which I already own, every prize would be magnificent! Good luck everyone and thank you so much Joanna for your generosity with all these gifts and for sharing your gift of writing with us! I heard the story from Rita, of how the blog post brought you back together after college, and I thought it was such a beautiful story & a wonderful way to reconnect!!! I’m over the moon that you read and liked The Unthinkable Triangle, and that it brought you to JAFF, that’s fabulous! Thanks ever so much for your kind words, they’re so special! Best wishes and the very best of luck!! A Cheery Hello from Nebraska! Guess the surprise? I’ll go with a Regency Dress Ball where Joana will dance every set! Even better — CF, CBC, AL, even Benjamin Withrow will be there to partner her! I have all her books (just finished MBDD) so if I’m correct, I’ll opt for the surprise! Hello back, Rose! Oh, what a dream that would be :)) Thanks ever so much for the lovely thought. I hope you’ll like the surprise. Fingers crossed and best wishes! I love all those books!! Is she coming to the US for a trip?? I’d love to, Christina, but not just when you’re about to come over, the timing would be shocking!!! Can’t wait for us to meet face to face at last. Happy planning and see you soon!!! What a great post! and I am super curious about the mystery prize! I would love to have KU to be able to read Miss Darcy’s Companion. I will have to buy it soon though! From the other options, I think I would love an e-book copy of From this Day Forward, which is, apart from Miss Darcy’s Companion, the only of her books that I don’t have. Thanks for stopping by, Daniela! I’m so happy you liked the post. I do hope you’ll like Miss Darcy’s Companion – how about giving KU a go, for the 1 month trial period? I saw something in Rita’s post about how that works. Thanks for talking part in the giveaway and best wishes! I am so glad that Joana will be having books (and I hope future books) on Kindle Unlimmited. I already own the three along with other books, which are all wonderful. I think she will be publishing a new book very soon! I would love to win eithr Subsequent Proposal or Second Chance. Thank you for the giveaway. So happy you liked my books, Eva, it’s so wonderful to hear that!! No imminent news on new books I’m afraid – I’m still writing my next and toying with all sorts of crazy ideas 🙂 – but I did write a story for Christina Boyd’s Anthology,The Darcy Monologues, due out on 21 May, and I hope you ‘ll like it. The whole book is a gem, so many of my favourite authors contributed!! Wishing you all the best and thanks for stopping by! If I win I would be honoured to win any of these prizes (excepting a copy of MBDD, which I’ve already read, thank you). A delightful post, tho’ I don’t subscribe to KU — already did the one-month free trial, and did not continue because the books have to be returned too quickly to allow a re-reading. Wishing you even more success with your KU venture, Joana. Many thanks for the kind words and lovely wishes, Janis, and thanks for stopping by! Best wishes, and I hope you win something you like! I don’t own From This Day Forward so would love to win that. I either purchased or borrowed the other books. Guess: Is she coming across the ocean to visit us in the USA? That is as much of a wish as a guess. I have read all her books and posted my own 5 star reviews. Thank you, Joana. You have a wonderful weekend also. I am visiting my younger brother in Malvern, PA today as he had a brain tumor removed last Saturday (9 hour operation). Taking some kiffles…a traditional Hungarian filled and rolled cookie that is so popular in this area of many immigrants. It was a scare but GOD brought him through and now he is in rehab. Thank you. I do appreciate it. He looked better than I expected today. I’ve read a few of Joana’s books and thoroughly enjoyed them. Congrats on getting your books up onto KU! Hopefully you’ll get more readers. Thanks for the giveaway. A pleasure, Priscilla! So glad you liked my books. Thanks for the lovely message and all the best! A lot of people go fo the audiobook but although it will be great, I will try to give another option: Darcy banging his head after the proposal? To be honest, I do not know but I would say maybe another book but this time not about P&P? That reminds me of a wonderful chat over hot chocolate & marshmallows, Ana 🙂 . Not Darcy banging his head 😀 (a really fun idea, BTW) but the conversation about another book ….? One of those days I’ll do my best to oblige 😉 Best wishes with everything you do and lovely to chat with you again! 😀 whenever you want, I’ll wait for it! I’m going to say it’s an audio book too! I actually like idea of Joy’s about being named a character in one of Joana’s books! As others have said, I too love all of Joana’s books and have them all on my Kindle! As for which prize to go for…door #3…the bag of goodies! Thank you! Lady Joy Malone has a great ring to it, doesn’t it, Carole? Thanks ever so much for the wonderful words about my books and fingers crossed for the bag of goodies 🙂 Best wishes and thanks for stopping by! I love a good mystery. My guess is that she is re-designing the covers for her books. Or is it she is selected as an ambassador for the Jane Austen Literacy Foundation? As for the prize (if I win, that is), I think I do not have a few of Joana’s books yet but I need to check which ones. But I also like the Austenesque goodies. And also the mystery prize… Call me greedy, but I feel like I would like to win them all. Thanks for the lovely guesses, Sylvia, and for the wonderful welcome at ‘My Love For Jane Austen’ with ‘The Darcy Monologues’ blog post and KaraLynne’s ever so kind fangirl post!! Have a lovely weekend, best wishes and fingers crossed for the win! Thanks ever so much and best of luck! Having read and reviewed all of Joana’s books I am happy more can also enjoy them through Kindle Unlimited. I have read The Falmouth Connection twice when Joy lent it to me but I just may borrow it and read it again through KU. Thanks for sharing the good news.